Charming T2 duplex with 1 bedroom, near the city center and overlooking the vineyard. Spend a few days in Ribeauville beautiful medieval city in which we live for 30 years; rich in its architecture, its soil, its authenticity, without forgetting its Christmas market that thrills young and old. 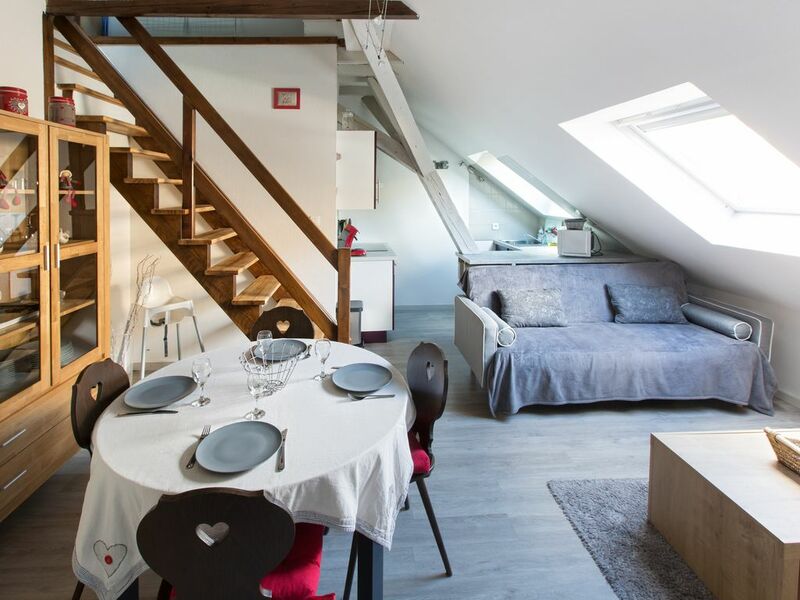 Charming gite Clévacances 3 * "The Ribeauvillé Manala" T2 duplex renovated 30m² (for 2-5 people) the 2nd and last floor of a beautiful building quietly located at 2 steps from the main street. - a bathroom with bath-shower, washing machine and a toilet. - bike paths and forest trails to discover our beautiful region in another way. Here is a small overview of what you can do by coming to discover our beautiful region. Please tell us the number of people in your rate application and the distribution adults / children. The reservation is effective after receipt of a deposit of 30% of the amount of the stay. The rates include the tourist tax; a deposit of 300 € is requested at the handing over of the keys. Possibility of short stay (minimum 3 nights) except school holidays. Optional final cleaning supplement: 40 €. As an option, I can provide you sheets and towels (8 € / person, excluding periods of Easter holidays and Christmas and late July-early August). - "Manala Riquewihr" duplex in Riquewihr can accommodate 2 to 6 people (No. 6667821 of the same site). For any further information, do not hesitate to join me on my cellphone. Looking forward to welcoming you very soon. Bathroom with washbasin, toilet, tub / shower and washing machine. As an option, I can provide you sheets and towels (8 € / person, excluding periods of Easter holidays, Christmas and late July-early August). Beautiful, quiet and close to towncenter. We stayed 4 nights in this beautiful appartment overlooking the vineyards. The appartment is newly renovated and all worked very well. Situated only 200 m away from mainstreet, but facing away from the city so no noise - we slept all nights with open windows. Beautiful city, superb appartment and fantastic area - highly recommended. Anne and Olivier are good and reliable hosts - all worked according to agreement. Many stairs = not suitable for disabled. Agréable et charmant duplex. Fonctionnel et très bien équipé notamment en chauffage. Emplacement idéal pour accéder au marché de noël. Nach der sehr freundlichen Begrüßung unseres Vermieters und Besichtigung der wirklich sehr schönen Wohnung haben wir uns sofort wohl gefühlt und auch die Abwicklung der Formalitäten war dank unserer Vermieter ganz unkompliziert!! Wir hatten wunderschöne Tage , vielen Dank!! Sehr schöne ruhig gelegene Ferienwohnung direkt am Weinhang und mit kurzen Wegen in die Innenstadt. Sehr sauber und mit allem ausgestattet, was man braucht. Ideal für zwei. Sehr nette Kommunikation mit der Vermieterin sowie persönlicher Empfang und Verabschiedung am Abreisetag. Frau Avezon gibt einem viele gute Tips zu Restaurants, sowie für Unternehmungen in der Gegend. Wir haben unseren Aufenthalt sehr genossen und können die Ferienwohnung uneingeschränkt an alle weiter empfehlen. Nous pouvons recommander ce gite. By the A35 and N83, exit Ribeauvillé From Mulhouse-Colmar-Ribeauville Guémar exit or from Strasbourg. Historical procession of Pfifferdaj (furs of the Ménétriers) every 1st Sunday of September. Christmas markets are essential at the end of the year; that of Ribeauvillé is magnificent (only the we of the 7/8 and 14/51 December) as well as those of Riquewihr, Kaysersberg, Colmar, Eguisheim, the way of cribs of Bergheim, not to mention that of Strasbourg. - a duplex apartment (2 to 6 persons) in Riquewihr under the number 667821.
tarif dégressif en fonction de la durée, caution demandée, arrhes de 30% à la réservation, remise des clés par le propriétaire non présent sur place. Court séjour à partir de 3 nuits possible. Forfait ménage facultatif : 40€.